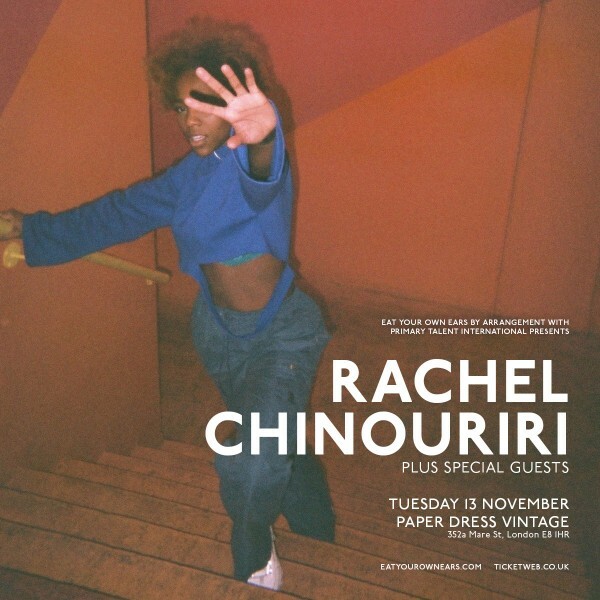 Eat Your Own Ears are proud to present Rachel Chinouriri at Paper Dress Vintage on 13 November. Tickets are on sale Friday 5 October at 10am. Rachel Chinouriri is a 19 year old singer/songwriter from Croydon. Having only released two official pieces of music, the wheels are already in full motion for Rachel. ‘So My Darling’, a sensitive and personal single chosen by Gus Unger- Hamilton (alt-J) as his favourite piece of new music, was played during his interview on Huw Stephens Radio 1 show last week And, Mahogany Sessions have already worked with Rachel to create a beautiful acoustic version of the track. Born and raised in Croydon, Rachel’s family’s traditional Zimbabwean values meant she sometimes felt isolated from her cultural surroundings. She found solace in writing and recording music, and at the age of 17 she wrote an EP and recorded it using a £20 Microphone, mixed it on her mums computer and dropped it on Soundcloud. The raw demos, aptly named ‘Bedroom Tales’, saw support from BBC Introducing pretty much instantly. With new music on the horizon and support swelling around her, it’s clear Rachel is one to watch for 2019.